C-FJZN at Sept Îles - CYZV, Québec. C-FJZN gets prepared for the float season. C-GJZN resting at Geraldton - CYGQ, Ontario. N3324T poses for "Bush Flying Captured's" Rich Hulina. • CF-JZN Aircraft Holdings Ltd., Montréal, QC. Delivered 18-Jul-1957. G. Rae MacLeod operating as Aircraft Holdings. • CF-JZN Leased to Wheeler Airlines, St. Jovite, QC. Based Frobisher Bay, NT. Accident: Fox 4 DEW Line Site (Cape Hooper) NU, on 28th October 1957 and lay there in a damaged condition for some months, until repaired and returned to service. Total time: 1,117hrs at Sep-1960. Incident. Forced landing in rough terrain. 16-Sep-1960. Caused by failure of the engine crankshaft had resulted in a complete power failure. It was substantially damaged in the landing. It was retrieved restored and returned to service. • CF-JZN Northern Wings Ltd., (Les Ailes du Nord), Sept Îles, QC Regd circa 1971. Accident: Havre St. Pierre, QC. 27-Dec-1973, operating on wheel-skis at the time. On the climb out airframe icing caused the pilot to complete a controlled collision with the ground, causing substantial damage. Repaired and again returned to service. • C-FJZN Re regd to Northern Wings Ltd., (Les Ailes du Nord), Sept Îles, QC. Circa 1964. • C-FJZN Air Fecteau Ltée., Senneterre, QC. Regd in in 1979. • C-FJZN Renamed as Propair Inc., Sept-Îles, QC. Regd 05-May-1982. Canx 10-Jun-1988. • C-FJZN Alexandair Inc., Sept-Îles - Lac des Rapides, QC., in June 1988. Canx 21-Jun-1994. Re regd 21-Jun-1994. Canx 26-Jul-1999. • C-FJZN Labrador Air Safari (1984) Inc., Jonquière, QC. Based Dorval, QC. Regd 16-Jul-1999. Canx 02-Sep-2003. Re regd 02-Sep-2003. Canx 09-Mar-2010. • C-FJZN Air Saguenay (1980) Inc., Jonquière. Based Baie-Comeau, QC. Regd 09-Mar-2010. • N3324T Blue Aircraft LLC., Ketchikan, AK. Regd 21-Feb-2019. Otter 205 was delivered to Aircraft Holdings Ltd, a leasing company, on 18th July 1957 registered CF-JZN. It was immediately leased to Wheeler Airlines of St. Jovite, Québec and went to work in the Arctic. It crashed at the Fox 4 DEW Line Site (Cape Hooper) on 28th October 1957 and lay there in a damaged condition for some months, until repaired and returned to service. By September 1960 the Otter had accumulated 1,117 hours on the airframe and was based at Frobisher Bay in the Northwest Territories, where Wheeler Airlines had a contract to re-supply a DEW Line radar site on Resolution Island, which lay off the southern tip of Baffin Island at the junction of the Hudson and Davis Straits. This was the contract on which Otter CF-GCV (2) was also used, as already recounted. Resolution Island had a 1,300-foot gravel landing strip. On 16th September 1960 CF-JZN took off from Frobisher Bay at 14:36 hours en route to Resolution Island, carrying the pilot, seven passengers, mail and cargo. A climb to 9,000 feet was commenced. The oil pressure dropped and the oil temperature rose. The pilot decided this was because of the climb, so he levelled off at 5,000 feet but there was no change in the oil pressure or temperature. The pilot considered the possibility that an oil breather was blocked by ice. A descent was made at York Sound to 800 feet where the temperature was 35F and all visible ice was dispersed. The oil temperature and pressure remained abnormal, made worse by climb power, so the pilot decided to return to Frobisher Bay. He established contact with Resolution and advised them of his position and decision to return to Frobisher. A further position report was given eight miles south of the Grinnel glacier, at which time the aircraft had reached 3,000 feet. A short time later, five miles south of the glacier, a severe vibration commenced and a film of oil slowly formed on the windshield. The situation worsened and the engine began to show signs of failure. Oil smoke began filling the cockpit, so the pilot pulled the emergency fuel and oil shut-off lever and turned off the ignition. The best available landing area was on a small peninsula. The initial touchdown was at a speed of 45 to 50 mph, then a solid jar was felt and the aircraft dropped its left wing when the undercarriage collapsed. The flight had lasted 2 hours 35 minutes, during the most part of which there had been oil pressure and temperature problems. The subsequent report found that a fatigue failure of the engine crankshaft had resulted in a complete power failure. JZN had been substantially damaged in the forced landing on rough terrain. It was however retrieved from that remote location, repaired and restored to service. The pilot that day was Kenneth Dempster who the following year, flying another Wheeler Airlines Otter (CF-IUZ) on the same contract, would rescue the crew of a downed USAF C-47 while on another flight between Frobisher Bay and Resolution Island. Otter CF-JZN continued flying for Wheeler Airlines until sold to Northern Wings Ltd (Les Ailes du Nord) in 1971. It became one of many Otters to serve the small communities along the northern coast of the Gulf of St. Lawrence. It suffered an accident at Havre St. Pierre, Québec, one of these small communities, on 27th December 1973, operating on wheel-skis at the time. As the accident report states: “Climb; airframe icing; controlled collision with the ground; substantial damage”. Once again, the Otter was repaired and returned to service, registered C-FJZN. The Otter was sold to Air Fecteau Ltée., Senneterre, Québec in 1979, which became Propair Inc., to which the aircraft was registered in May 1982. 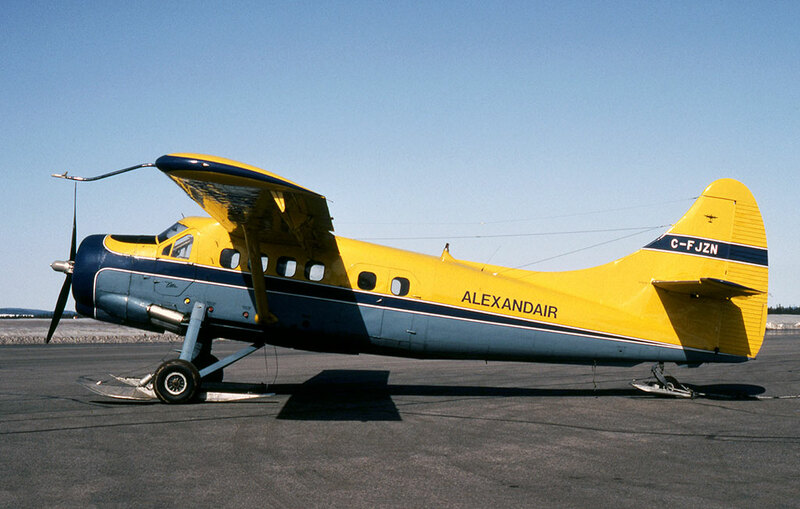 It was sold on to Alexandair Inc., based at Sept-Îles - Lac des Rapides, Québec in June 1988 and painted in their attractive blue and yellow colour scheme. The company underwent a re-structuring and the Otter was registered to Alexandair (1994) Inc., in June 1994. 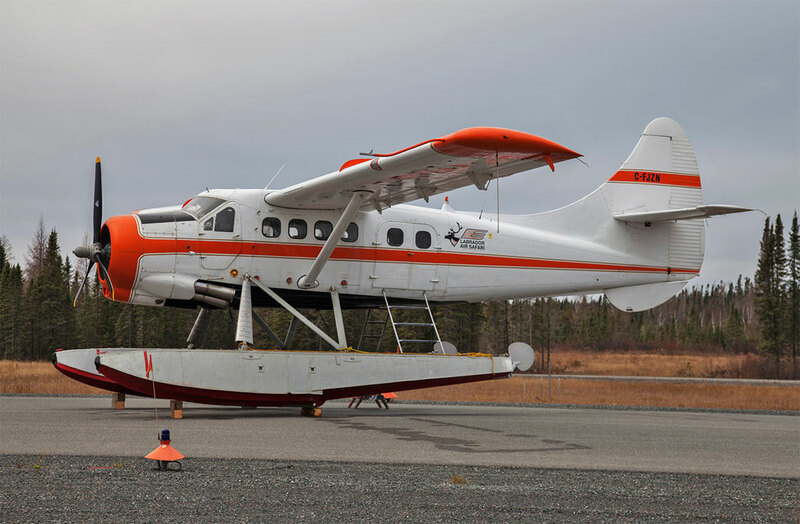 It was sold to Labrador Air Safari (1984) Inc. in July 1999, based at Baie Comeau, Québec, one of a number of Otters flying for this company, active during the summer months carrying hunters, fishermen and tourists into the wilderness areas of Québec. During the winter of 2001 / 2002, the Otter was repainted into Labrador Air Safari's own colour scheme. 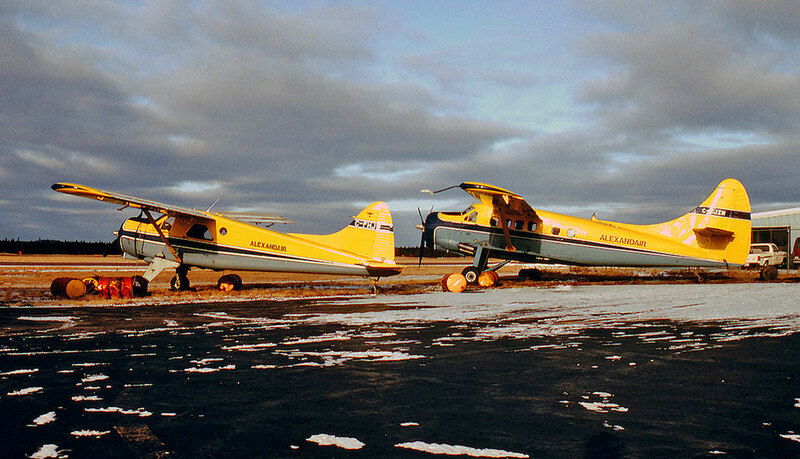 For summer 2002 and subsequent years, JZN was operated by Labrador Air Safari on behalf of Jack Hume Adventures Inc., an outfitting company based at Schefferville, Québec. For this purpose, the Otter carried the logo of Jack Hume Adventures and joined Cessna 185 C-GQDB based at Schefferville. 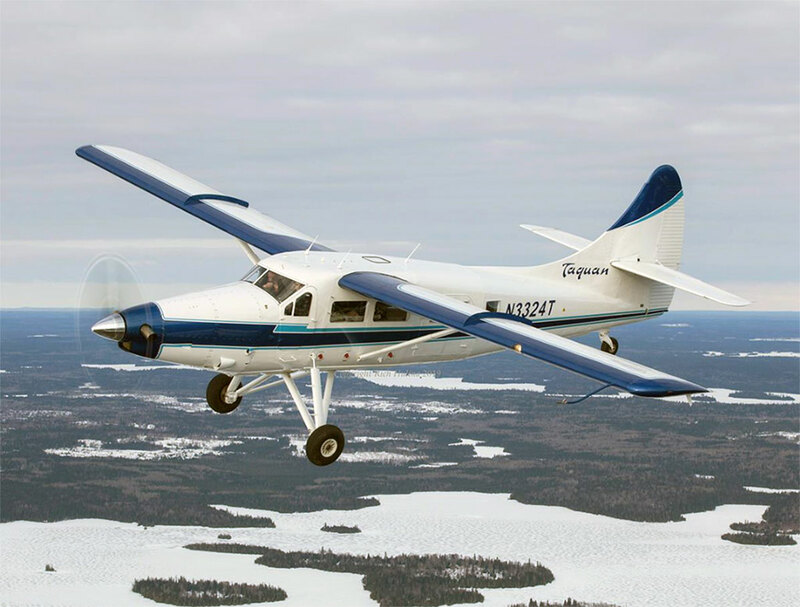 The outfitting company ran 25 camps throughout the Ungava region of northern Québec and used a chartered Convair 580 to fly its hunting and fishing customers up to Schefferville, and then the Otter and Cessna to fly out to and between the camps. 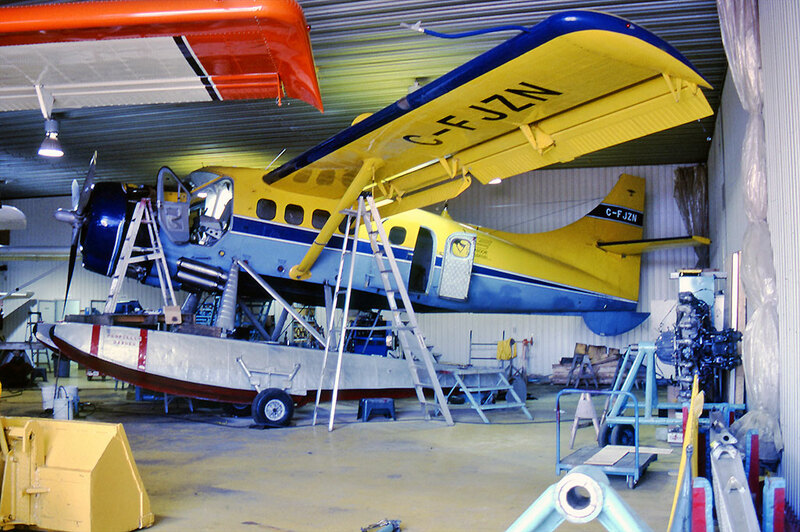 Each winter the Otter returned to the Labrador Air Safari base at Baie Comeau for overhaul and winter storage. Labrador Air Safari is an associated company of Air Saguenay and although it continues to operate as a separate entity, its aircraft have all been registered to Air Saguenay. Otter JZN was registered to Air Saguenay on 9 March 2010. It features in a CADORS report on 10 July 2011. The Otter was on a VFR flight from Wabush, Labrador. Winds were 030 degrees at ten knots. The Otter on floats took off in a crosswind from the left. The aircraft left the lake surface at the decision point of take-off. During the initial climb the performance seemed good but after a few seconds the pilot realised that the aircraft did not have enough altitude to go over a transmission line. The pilot decided to execute a precautionary landing. He made a left turn and set the aircraft about 100 feet before the end of the lake. The Otter continued into a river dotted with shallow rocks. The left float struck a rock and JZN came to rest in shallow water. No one was injured and damage to the Otter was limited to the underside of the left float. This was repaired and the Otter returned to service. JZN continued to fly for Labrador Air Safari in the years that followed. At the end of July 2012 it was advertised for sale, on EDO 7170 floats and with a total time of 25,494 hours. It did not sell but continued flying for Labrador Air Safari during the summer months, in storage over each winter. It was advertised for sale again in February 2015, with an asking price of $625,000 and by that stage its total time had increased to 25,668 hours. It flew again for summer 2015 and summer 2016 but a sale was then achieved and by November 2016 it had arrived at Geraldton, Ontario. It had been sold to a buyer in Kenai, Alaska but in the meantime it would remain in storage with Recon Air in Geraldton over the winter of 2016 / 2017. By March 2017 work had started on the Otter at Geraldton to convert it to a Vazar turbine. The piston engine was taken off and sold to the owner of Otter C-FAZX (458) in Québec for use with his Otter. JZN received a complete rebuild and had scenic windows installed. By February 2018 work on the Otter was substantially complete but the new PT-6A turbine engine was still to be fitted. On 12 February 2018 JZN was registered to Willian J. Alder of Campbell River, BC., who is the owner of Sealand Aviation, this registration being in connection with the aircraft’s sale to Alaska. His registration was cancelled on 7 May 2018 and on the same date the aircraft was deleted from the Canadian Register “on export to the USA”. At the same time American registration N3324T was reserved for Blue Aircraft LLC., of Ketchikan, Alaska, the parent company of Taquan Air. By September 2018 the engine had been fitted and the Otter repainted and its new registration applied to the aircraft. However work was still progressing on the instrumentation and fitting out the interior. This work was nearing completion at Geraldton during December 2018. Aircraft delivered to Courtenay, British Columbia for fitting of floats. Left Geraldton 01 April 2019.